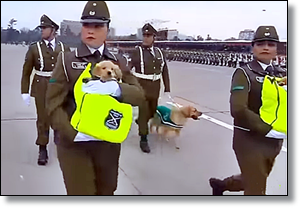 Chile's annual military parade took place on Thursday, capturing the crowd's attention with adorable golden retriever puppies. Indeed, a row of golden retriever puppies, tucked into neon green bags and carried by the country's national police force canine unit, became a highlight of the parade. A line of adult retrievers wearing boots followed suit. The Great Military Parade in Santiago was held in honor of Chile's 208th Independence Day anniversary and featured more than 9,500 troops. It had millions of viewers nationwide, The Evening Standard reported.